Fiestas Patrias Committee and the Mexican Consulate in Chicago hosted the 204th Anniversary of Mexico’s Independence on Monday, Sept. 15th in Pilsen which featured performances by Mariachi Mazamitla de Jalisco and folkloric dancing from various groups, such as Quetzalcóatl. At Harrison Park, families had the opportunity to enjoy an array of live music performances, food, and folklore. 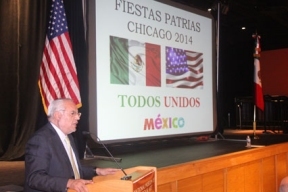 The festivities concluded with the traditional Grito de Independencia lead by Consul Carlos Jiménez Macías at 10p.m. Other performances included, Furia Norteña, Griselda Barajas, and Trío los Primos to name a few.